There is touch and nothing besides touch to make a connection. A simple touch with my big manly warm hands on your back as I encouraged you to simply breathe deeply and slowly. Using deeply relaxing strokes, mixed with light masculine touch I slowly massage you as you become aware of my physical proximity. Experience an awakening, a deeply nurturing massage by another man. After years of striving to give pleasure, isn’t it your turn to be nurtured. Every massage I do is unique. I work from a extraordinarily comfortable massage table so men of all ages, shapes and sizes, straight, gay, bisexual and bi curious men are all welcome. My private mystical studio apartment is warm, inviting and relaxing. It features my art, candles, aroma, colour, and music.From the moment you enter the surroundings will begin to soothe your spirit. My pioneering celebrations offers all men, regardless of sexual orientation or sexual history, the opportunity to reclaim and reawaken the spiritual dimension of their masculinity. I offers a daddy bear service, where you can rest, maybe sleep a little, or just relax, while you are hugged, massaged, and spiritually cuddled. 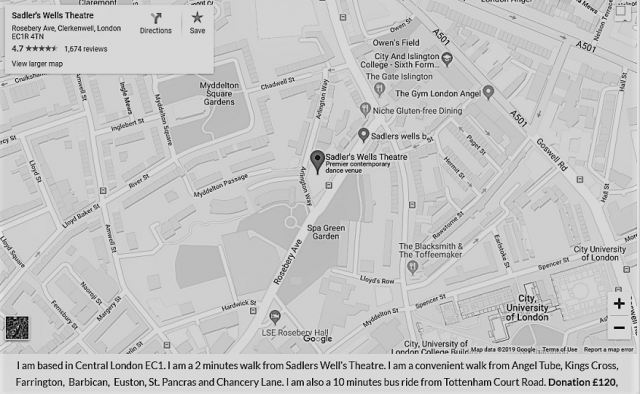 I am based in Central London, very close to Sadler’s Wells Theatre(EC1), a convenient walk from Angel Tube, Kings Cross, Farrington, Barbican, Euston, St. Pancras and Chancery Lane. I am also a 10 minutes bus ride from Tottenham Court Road. Click here o read my amazing reviews. “So glad I took the original step as you put me on the road to sexual self-esteem and for someone who thought he’d never make it, that’s pretty good value”. Phil.